VOLVO BALLERINA STUNT! Crossing Slackline Between TWO TRUCKS in Motion! - Muscle Cars Zone! Faith Dickey is a world records holder for both the highest and longest female slackline walks. However, this Volvo stunt is maybe her most challenging feat yet. In this one, she walks across a strung that`s attached between two trucks as cars roam down a highway at 80 mph. Faith Dickey managed to successfully go across the rope just a mere split second before the semi-trucks enter separate tunnels. This happens just before the rope is snapped on the brick wall between them. This Volvo sponsored stunt with Crossing Slackline happened on a closed highway in Croatia. 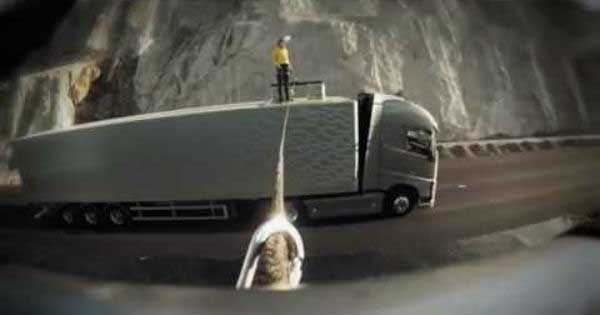 Volvo did this to promote the smooth handling system of its Volvo FH truck model. However, you must be wondering how she managed to defy physics like this? Fortunately for us, physicist Louis Bloomfield from the Virginian University is here to give us an explanation. She says that the stunt that Faith Dickey managed to perform was both daring and took a lot of skill. However, she also continues to say that the unknown truck drivers of these trucks deserve a huge nod as well. The biggest challenge for Dickey in this stunt was the air resistance that occurs when hurtling along a highway at 80mph. However, Dickey is one awesome athlete who managed to angle her body perfectly as she went across the rope. However, any small veering by the semi-trucks could have easily thrown Dickey off balance. The truck drivers in this video demonstrate massive skills at staying parallel to maintain the slackline still. That`s why we are astonished by the skills these truck drivers possess and the Crossing Slackline action. Finally, check out the best advertisements by Volvo!